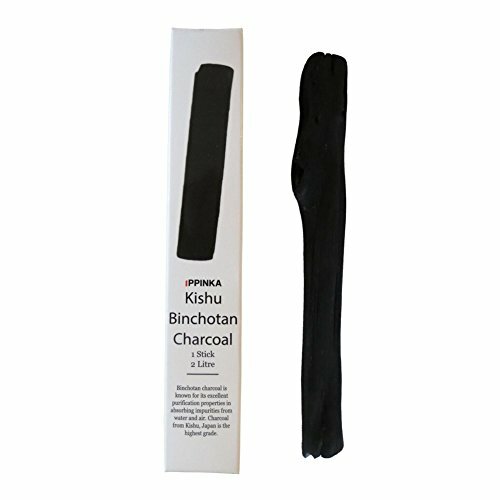 Kishu Binchotan (Japanese Oak) Charcoal is known as the best quality charcoal for purifying water. Binchotan charcoal is activated through an extremely high burning temperature and a rapid cooling process. Binchotan absorbs chlorine and other chemicals from drinking water while releasing natural minerals into it. Binchotan has an alkaline effect - it softens and improves the overall taste of water. Bichotan can be re-used up to about 3 months. It can be easily recycled by breaking it into small pieces and placing them into your plant soil, creating micro water and air cavities in the soil. Made in the Kishu region in Japan. First use: rinse with water and boil for 10 minutes and let dry. Stick must sit in 2L of water for approximately 3-4 hours before its ready to drink. Each stick has an approximate diameter of 0.8", and an approximate length of 5.9". If you have any questions about this product by IPPINKA, contact us by completing and submitting the form below. If you are looking for a specif part number, please include it with your message.